Thank you for your dedication, loyalty and service. Your time in service will always be appreciated and remembered. RIP, Officer Simpson. Praying for you and your loved ones. Rest in peace Sister Leann. 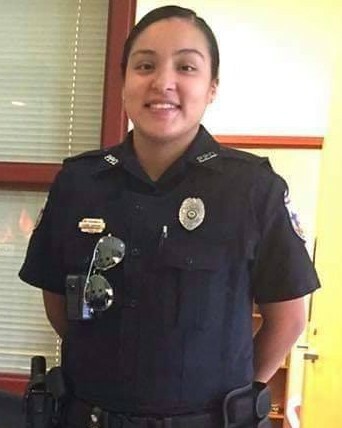 Officer Simpson, it breaks my heart to see a beautiful young woman like you being taken away so soon, so fast. Only our all-knowing, all-loving God would be able to explain. May He immerse you and those you love in His Divine Mercy. Rest in peace, good and faithful servant. My family and I would like to extend our sincere condolences to the family, friends, and fellow co-workers of Police Officer Leann Simpson during this difficult time. May they find comfort and support from those around them. May happy moments from the past bring forth precious memories to cherish for a lifetime. May God help heal their aching hearts. Thank you for your service and may you rest in peace Police Officer Leann Simpson. Dearest Family, Friends, CoWorkers - our prayer is that the Holy Spirit of God console, encourage and give you peace during this most difficult of time. The First Responder is chosen, Wisdom & Courage is their fortitude for endurance. Fear & Duty is discipline. Caring, support & sacrifice is perpetual. Still we continue forward (PS 73;14) and when theres trouble we will assist & aid one another. We are Brethren (1Peter 1; 22) the loss of a 1st Responder is a Nations loss. We Honor the fallen through Integrity & courage, until we see each other again. Proverbs chapter 3 verses 23, 24, 25 & 26. Thank You Officer SIMPSON for your Service to our Country and to your Community. On behalf of POINT 27, we would like to offer condolences for Officer Leann Simpson. Please know we are eternally grateful for Leann’s service and her ultimate sacrifice. To honor Officer Simpson, POINT 27 sent 27 Thin Blue Line Dog Tag Necklaces, engraved with “Blessed are the Peacemakers for they will be called children of God” Matthew 5:9, to the Philadelphia, Mississippi Police Department for Leann’s partner and fellow officers. POINT 27 sent Folded Flag Necklaces engraved with “Greater Love has no one than this; than to lay down one’s life for one’s friend” John 15:13 for Officer Simpson’s parents. Blessed are the peacemakers...rest in peace. My thoughts and prayers are with the family and the department. May it help in some small way knowing others care. Rest in peace Officer Simpson! Rest In Peace, Sister. We mourn with your blue family and all of your loved ones. May they find solace in your dedicated service to our country and your community. Sympathy and prayers for her police and personal families, and also to those on the radio who had to endure this sadness. Rest in peace Officer Leann Simpson. Prayers and condolences for family & friends. Thank you Officer Simpson for your service to your country and your community. May God hold your family and co-workers in His Loving and Healing arms. Our hearts go out to everyone touched by this very sad event . May God watch over all of our Women and Men in Blue . Rest In Peace and thank you for your sacrifice . Rest in Peace Officer Simpson. Thank you for your service. My thoughts and Prayers go out to your family, coworkers and friends.